Ticket King Milwaukee Wisconsin: TICKET KING MILWAUKEE LOVES RASCAL FLATTS! Friday night I was able to do something I've never done before! 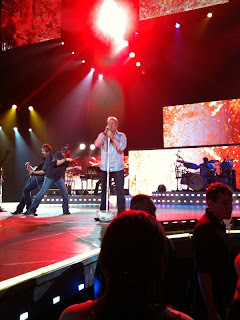 I sat 3rd row center at Rascal Flatts at the Bradley Center with my sister! It was amazing! I was in awe the whole time! The set up was great with the catwalk out to the center of the Bradley Center so the artists were able to walk past us and shake our hands! Darius Rucker opened for the band and he was great! He even played some of his old school Hootie and the Blowfish songs. I might just be so spoiled now that I wont want to sit anywhere else but third row! Rascal Flatts put on an awesome show! It was worth every penny!